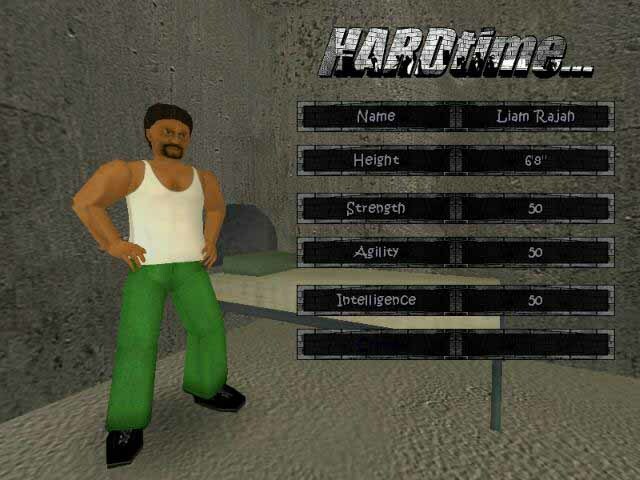 Free download Hard Time game. It is adventure and action game for PC. This game is about the life of prison and prisoners. The game is developed by MDickie. In this game, your player is represented to court as a suspect. The judge will take decision according to evidence and order to put you into jail for some days. Hard Time game has three “New Game” modes. Each mode has a different case such as murder or drug dealing. After hearing, you are given custody of Warden who takes you to jail. When the game Hard Time starts, you will find yourself into main hall along with warden. Hard Time is really a hard time into prison for you. It is very difficult to survive in this prison. If you want to survive by following the rules, it may be proved good for you but it is very difficult. When the game will start, you will see two bars at the top left corner. Green bar shows your health while yellow bar shows your attitude such as coolness anger. You will also look your strength, agility, intelligence and reputation percentage. If you want to increase your health, you have to go towards hospital from main hall. Using any bed from hospital, you can increase it. If you want to increase yellow bar, you can increase it by watching TV in main hall. Hard Time game’s main hall is the heart of this game. There are four prison blocks which are South Block, East Block, West Block and East Block. The entrance of each block is within main hall. You can take your way to your cell according to your number. For example, if your number is E-003, it means you are related to East Block and cell number 3. If you want to follow the rules then you should keep an eye on announcements. Take your way to your cell when it is time for lockdown or go to canteen from main hall when it is time to dinner. You can improve your body by weight lifting from exercise yard. Library room will cause to increase your intelligence. You can read a book to increase your intelligence. If you want to use toilets, then you have to proceed to hospital from where you can get into bathrooms.